The presence of breast cancer in any first-degree female relative in general nearly doubles the risk for a proband and the risk gradually increases with the number of affected relatives. Current advances in molecular oncology and oncogenetics may enable the identification of high-risk individuals with breast-cancer predisposition. The best-known forms of hereditary breast cancer (HBC) are caused by mutations in the high-penetrance genes BRCA1 and BRCA2. Other genes, including PTEN, TP53, STK11/LKB1, CDH1, PALB2, CHEK2, ATM, MRE11, RAD50, NBS1, BRIP1, FANCA, FANCC, FANCM, RAD51, RAD51B, RAD51C, RAD51D, and XRCC2 have been described as high- or moderate-penetrance breast cancer-susceptibility genes. 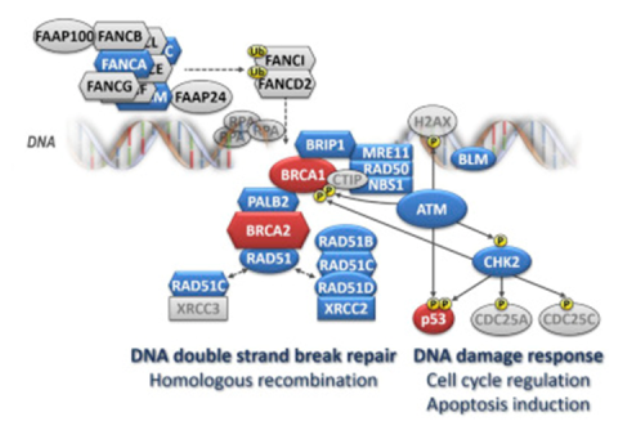 The majority of breast cancer-susceptibility genes code for tumor suppressor proteins that are involved in critical processes of DNA repair pathways. This is of particular importance for those women who, due to their increased risk of breast cancer, may be subjected to more frequent screening but due to their repair deficiency might be at the risk of developing radiation-induced malignancies. It has been proven that cancers arising from the most frequent BRCA1 gene mutation carriers differ significantly from the sporadic disease of age-matched controls in their histopathological appearances and molecular characteristics. 1. Hege Edvardsen 09.05.2007; Title of the thesis: Genetic variation and response to radio- and chemotherapy and adverse side effects in cancer patients. 2. Silje Nordgard 15.05.2008; Title of the thesis: Genetic background and molecular phenotypes of breast cancer: From single gene variants to pathway and whole genome patterns. 1. Women at high risk of breast cancer: Molecular characteristics, clinical presentation and management. 2. rs2735383, located at a microRNA binding site in the 3'UTR of NBS1, is not associated with breast cancer risk. 3. Genetic Risk Score Mendelian Randomization Shows that Obesity Measured as Body Mass Index, but not Waist:Hip Ratio, Is Causal for Endometrial Cancer. 4. Five endometrial cancer risk loci identified through genome-wide association analysis. 5. Fine-scale mapping of 8q24 locus identifies multiple independent risk variants for breast cancer. 6. CYP19A1 fine-mapping and Mendelian randomization: estradiol is causal for endometrial cancer. 7. Comprehensive genetic assessment of the ESR1 locus identifies a risk region for endometrial cancer. 8. Height and Breast Cancer Risk: Evidence From Prospective Studies and Mendelian Randomization. 9. Novel Associations between Common Breast Cancer Susceptibility Variants and Risk-Predicting Mammographic Density Measures. 10. Assessment of variation in immunosuppressive pathway genes reveals TGFBR2 to be associated with prognosis of estrogen receptor-negative breast cancer after chemotherapy. 11. Genome-wide association analysis of more than 120,000 individuals identifies 15 new susceptibility loci for breast cancer. 12. Candidate locus analysis of the TERT-CLPTM1L cancer risk region on chromosome 5p15 identifies multiple independent variants associated with endometrial cancer risk. 13. MicroRNA related polymorphisms and breast cancer risk. 14. Fine-mapping of the HNF1B multicancer locus identifies candidate variants that mediate endometrial cancer risk. 15. Evidence that breast cancer risk at the 2q35 locus is mediated through IGFBP5 regulation. 16.Genetic variation at CYP3A is associated with age at menarche and breast cancer risk: a case-control study. 17. The 5p12 breast cancer susceptibility locus affects MRPS30 expression in estrogen-receptor positive tumors. 18. Large-scale genotyping identifies 41 new loci associated with breast cancer risk. 19. CHEK2*1100delC heterozygosity in women with breast cancer associated with early death, breast cancer-specific death, and increased risk of a second breast cancer. 20. Common breast cancer susceptibility variants in LSP1 and RAD51L1 are associated with mammographic density measures that predict breast cancer risk. 21. 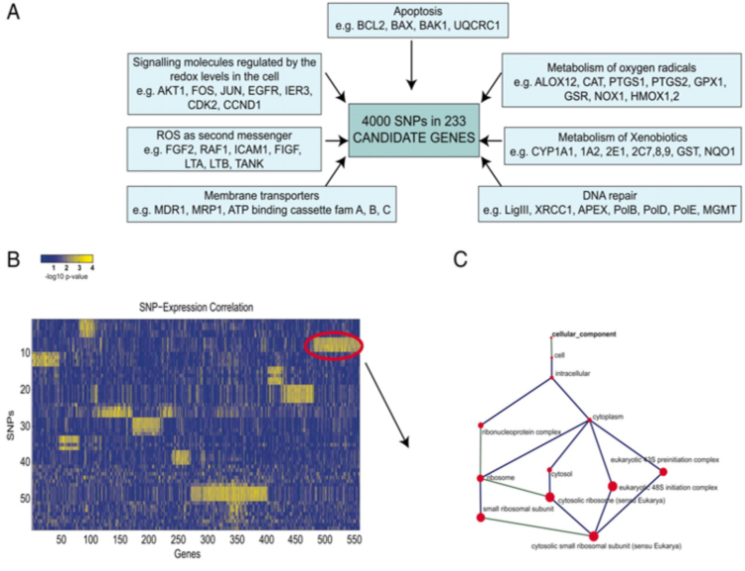 Genetic variation in putative regulatory loci controlling gene expression in breast cancer.